Get a head start on spring cleaning with these plans for the ultimate in home organization. Featuring solutions for practically every room of the house, you’ll be able to wrangle kids’ toys, spices, garden tools, and other items that contribute to clutter at home. The best part: they all include detailed plans that explain exactly how you can make the items for yourself. Check out our favorite free home organization plans for great ideas to tidy up your living space. 1. 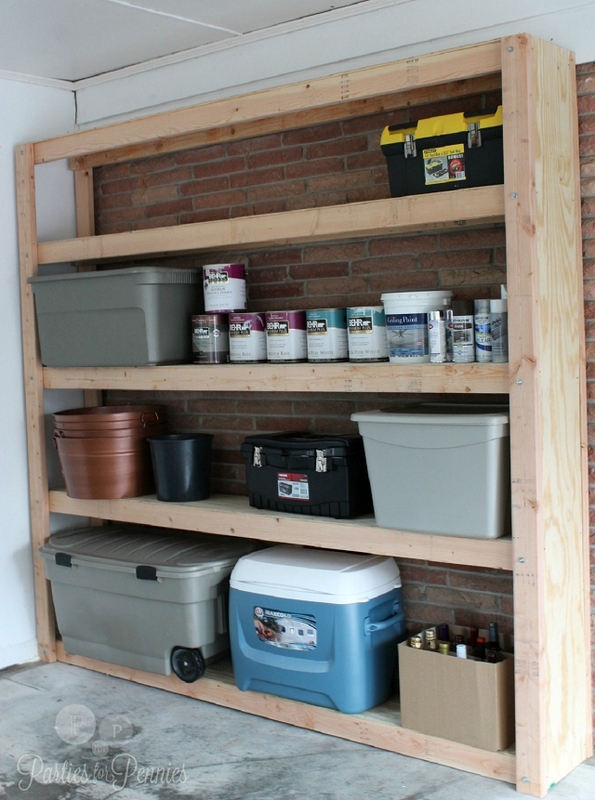 Parties for Pennies: Garage Shelving Plans Reclaim floor space in your garage by building these super simple, ultra functional storage shelves. Parties for Pennies says that they tripled their storage space! The best part: building these shelves requires only basic tools, so they’re a project that even beginner builders can tackle. Remodelaholic’s cabinet storage bins cleaned up bathroom clutter, but we could really see these working well in a kitchen. Put them behind a cabinet door, or even hang them on your pantry. Using pine board, mending plates, screws, and a little know-how, you can create this storage that hangs right from your cabinets. 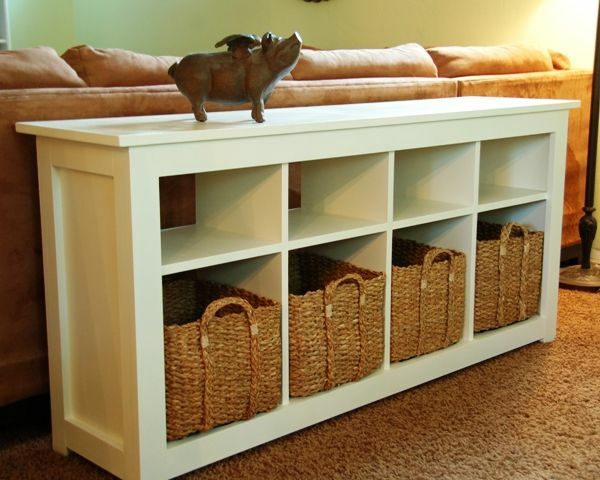 Make the most of a small storage space with smart organization. These incredibly detailed plans from Tom Builds Stuff shows how you can add hanging space, shoe storage, and more, all in the same small closet. The project is easy to tackle, and even better: it only costs about $50 to put it all together. Designs by Studio C features a stylish Urban Outfitters-inspired storage solution made almost entirely out of plywood. It’s easy to construct and make personal with your own embellishments, including stain, scrapbooking paper, and galvanized ribbon. Everyone has a junk drawer in the kitchen. But it doesn’t have to actually look like junk. 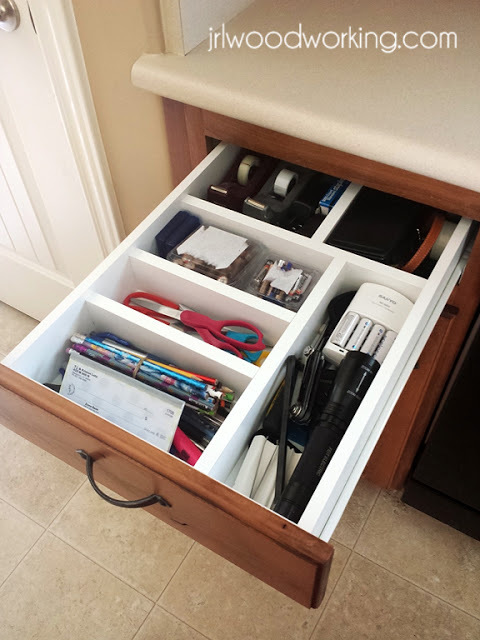 Use these free plans from JRL Woodworking to create organized spaces for all of the essentials that call your junk drawer home. 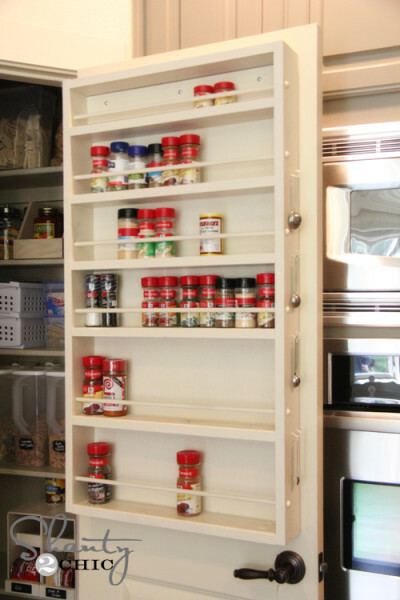 Create a custom solution for your spices with this pantry door spice rack. Hang it on your pantry door, wall, or backsplash for easy access. This easy to make rack uses boards and dowels, and comes together quickly. You can even add hooks to hang measuring spoons! 7. 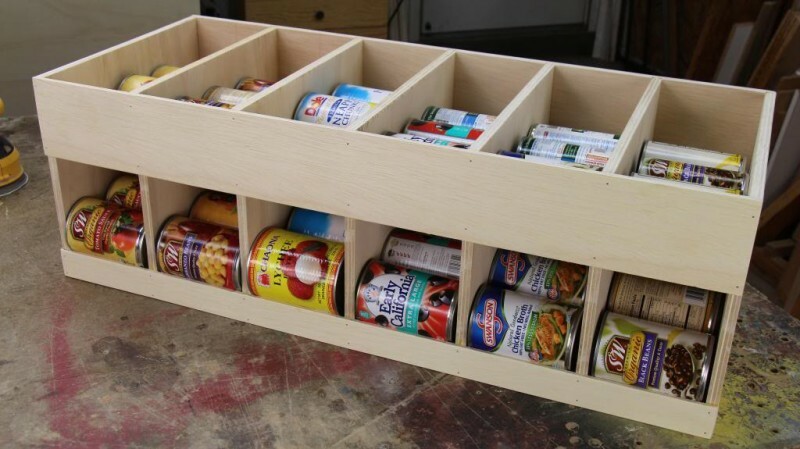 Woodworking for Mere Mortals: Canned Goods Dispenser Plans Storing canned goods in your pantry can easily become a mess. With this organizer, you can easily dispense standard sized cans — and make your pantry look good doing it. The organization also makes it easier to find the can you’re looking for, saving time and avoiding dropped cans. 8. Sawdust Girl: Pull-out Sweater Drying Rack Sweaters are best dried on a rack, but finding space for that rack can be a problem. Sawdust Girl has a solution: pull out drying racks. She suggests putting them on the top drawer of a cabinet, or, like her, above your washer and dryer. 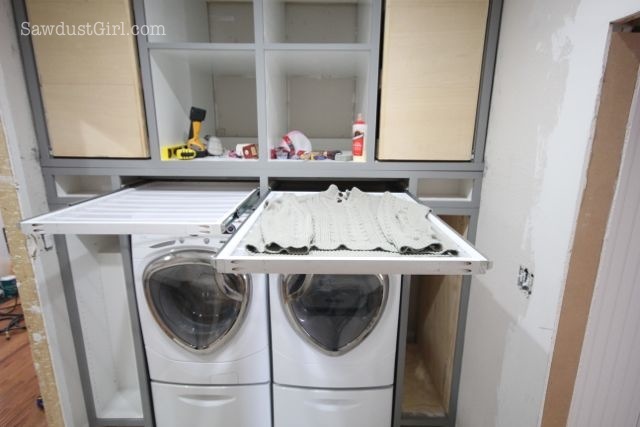 You’ll need laundry bags, drawer glides, scrap wood, and assorted hardware to put these together, but the plans are simple and easy to follow. 9. 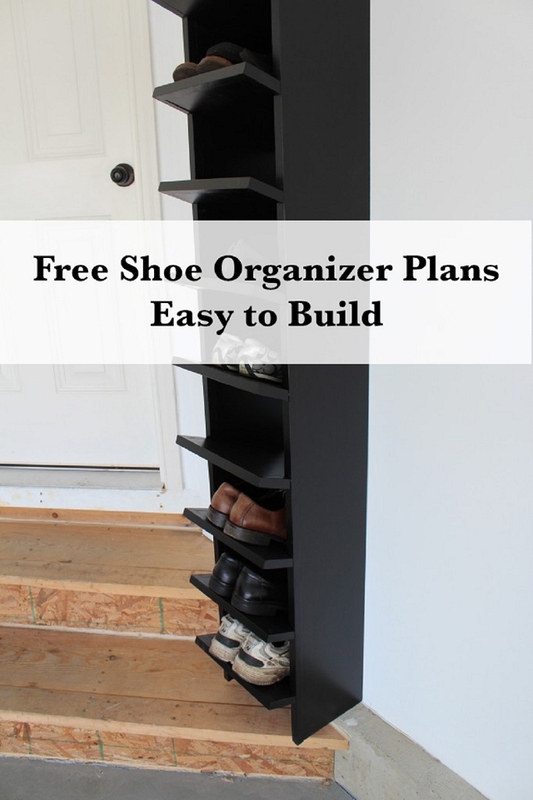 Our Home from Scratch: Shoe Organizer Plans Wrangle your shoe collection into a manageable organizer with this project from Our Home from Scratch. Made from plywood and secured to the wall with toggle bolts, this is a secure, functional, and easy to make organization project. Build it for your closet, or like Our Home from Scratch, as an organization tool to catch shoes at the door. 10. 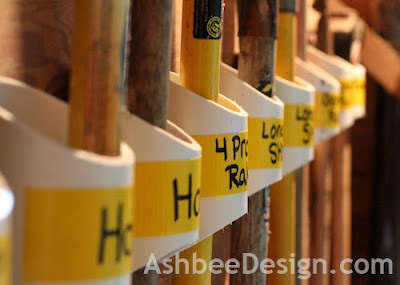 Ashbee Design: PVC Garden Tool Organizer Plans Instead of leaning garden tools in a cluttered corner, make them stand at organized attention with these plans from Ashbee Design. Simply mount cut PVC on plywood for more streamlined access to your long handled tools. These plans even include storage for small hand tools on the bottom! 11. 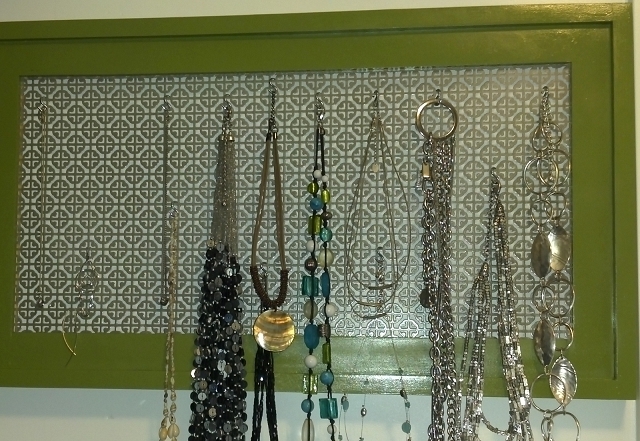 Her Tool Belt: Jewelry Display Board Plans Her Tool Belt has great plans for a jewelry board that puts your necklaces, earrings, and other jewelry on display, instead of cluttered in a jewelry box. You’ll need an aluminum sheet, pine board, and s-hooks to make it all come together in this easy, functional project. 12. The Design Confidential: Pet Organization Dresser Store pet food, toys, leashes, and other accessories in style with this organization dresser. The plans also include a space for food bowls, so they can be tucked away when pets aren’t eating. The Design Confidential estimates that this entire project costs only $50. 13. 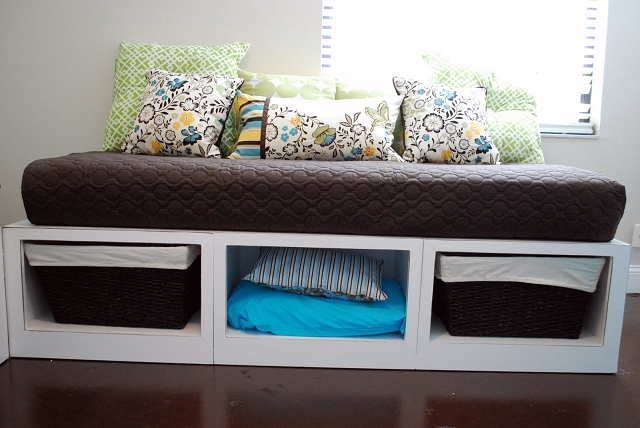 Kara’s Korner: Storage Daybed Plans Kara built these daybeds for her nieces to sleep on while visiting her home, but they double as smart storage, too. The platform includes three large boxes, perfectly sized for organizing boxes or bins. 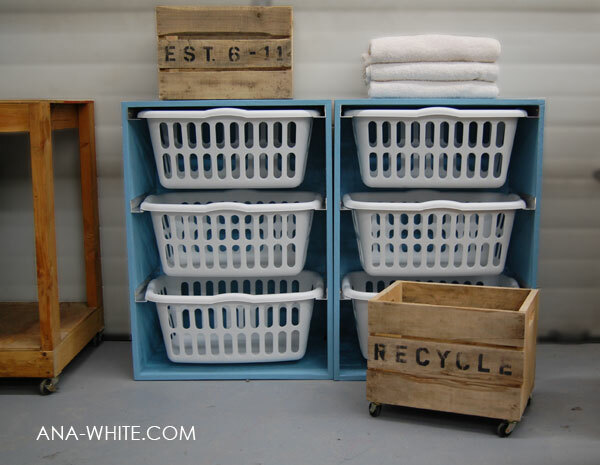 Ana White’s genius idea makes laundry basket storage smarter, allowing for stacking and even labeling. Note: Ana White’s website has thousands of free plans for organization and more. Using leftover countertop and a storage cube, this well organized kitchen island comes together for form and function. 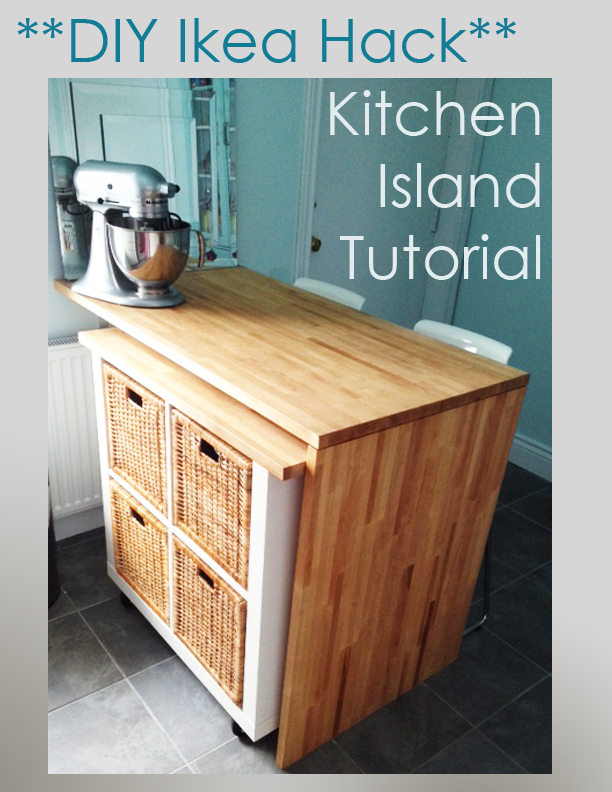 It adds valuable counter space, and with the addition of casters, can be moved for extra space in the kitchen. 16. Take the Side Street: Organized Sofa Table Inspired by an Ikea sofa table, Take the Side Street put together this lovely piece that adds storage to her living room seating area. 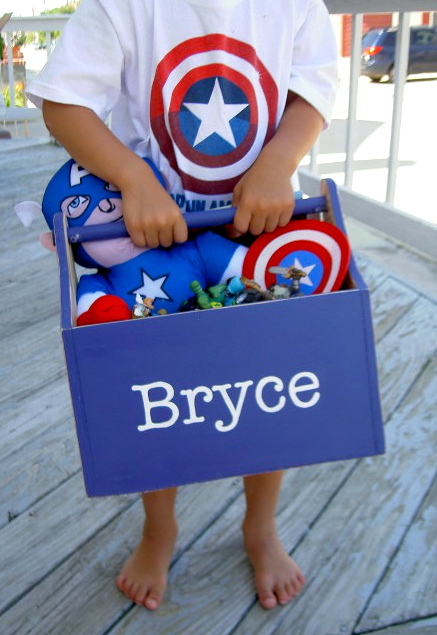 With organizing baskets, it’s also a great place to store toys for easy access. And you can put it all together for less than $100. 17. 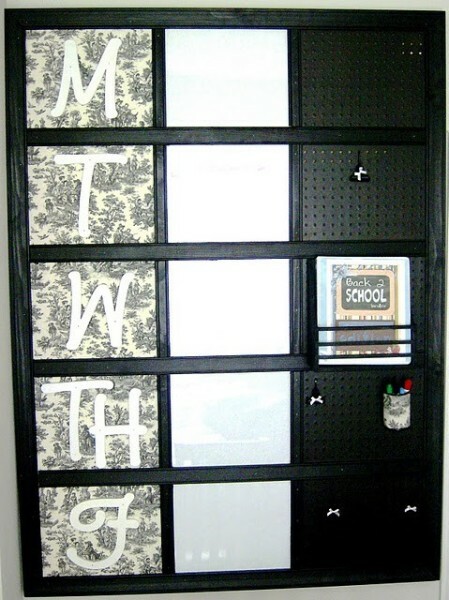 Build It, Sew It Love It: Home Organization Wall Unit A Pottery Barn Kids knock off, this wall unit from Build It, Sew It, Love It uses old vegetable cans, peg board, hooks, and a book rack for keeping the entire family organized. It’s a customized solution for far less than retail. 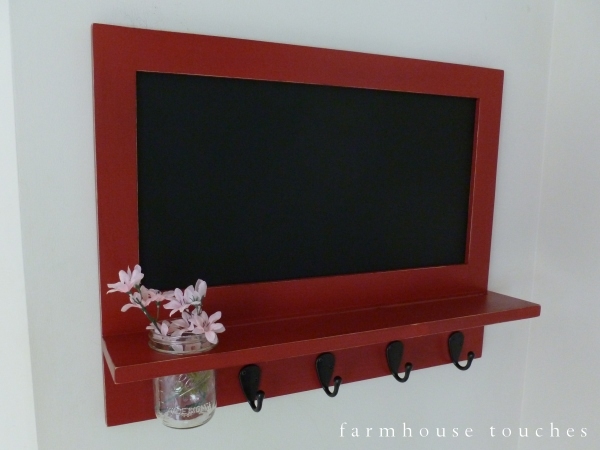 Catch purses, scarves, backpacks and important notes by the door with this stylish entryway organizer. Extremely detailed plans explain exactly what you’ll need to do, right down to creating the chalkboard and hanging hooks. 19. That’s My Letter: Toy Trug Plans Perfect for toys, utilities, books, or craft items, this handy trug is also easy to make. Made of just plywood and dowels, this project couldn’t be cheaper either. Make one, or make several for plenty of organization options. Chalkboard Blue made these garage storage lockers in 3 days! They are the perfect solution for storing coats, backpacks, and shoes in the garage, and they look good doing it. 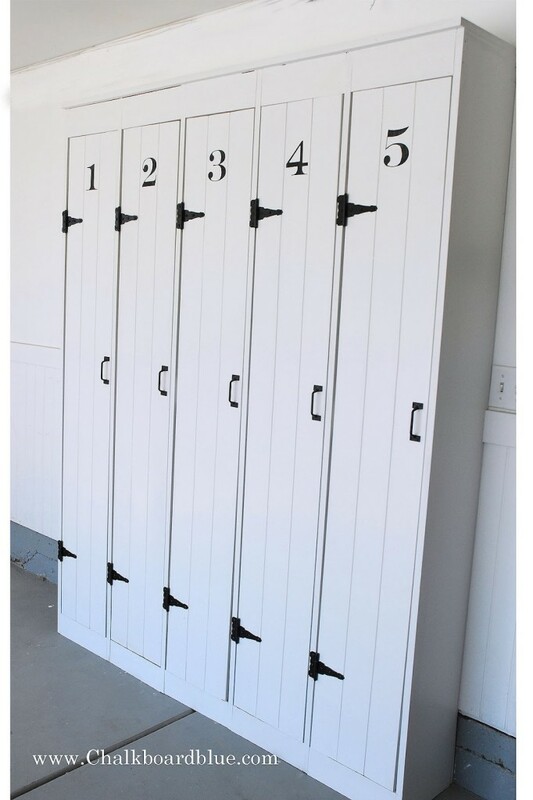 Though the original lockers were made for a garage, they’d be at home in an entryway, kids’ room, or craft area. Are you inspired for a more organized home yet? Put your hope into action with these great plans for creating a perfectly organized home.